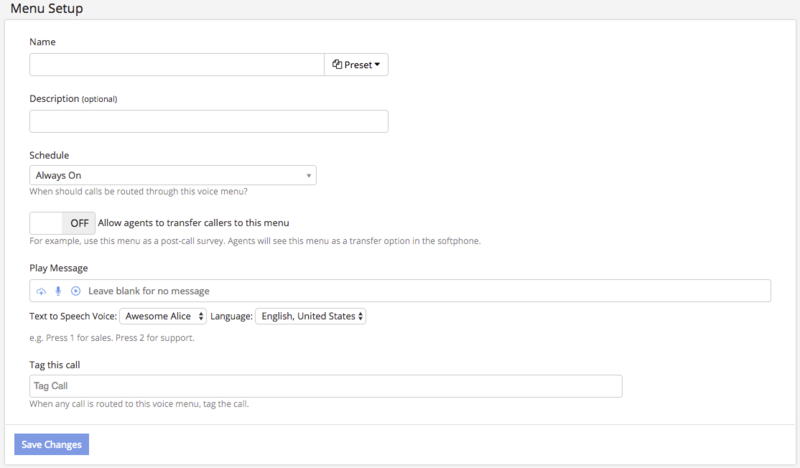 Voice menus are a routing option that allows you to route callers based on keypress or based on speech recognition. Callers can listen to a greeting explaining the menu options, then make a selection. Menu options can be used to route calls using receiving numbers, queues, smart routers, and more, or you can use them to gather information and fire pixels. Each menu option can be automatically tagged, assigned to a specific agent, or trigger updates to a custom field. To get started, go to Numbers → Voice Menus (IVR). This page will display all of the voice menus already set up in your account. To create a new voice menu, click the “New Voice Menu” button to create a newvoice menu. The Menu Setup section of this page is where you will configure thevoice menu name, description, schedule, after hours actions, ability to transfer, call tags and the message played to the caller. 1) Navigate to Numbers → Voice Menus (IVR). 2) If you wish to use a pre-made menu, use the Preset drop-down to select a template. By default, Voicemail is a preset in every account. You can make further changes once the preset has been applied. 3) Enter a name for the menu. 4) Select a schedule to control when this voice menu is accessible. You can leave this as “Always On” and the voice menu will be available at all times. You can select one of your created schedules in the drop-down menu, and this will open a new field for Default After Hours actions. 5) If you are using the softphone to handle calls and want agents to be able to manually transfer calls to this menu, you can click the toggle for Allow agents to transfer calls to this menu. 6) Use the Play Message field to enter the greeting you want your callers to hear by using one of the options below. Type in the field to use the text-to-speech engine, or you can upload or create your own audio file. 7) If you would like to automatically add a call tag to calls routing to or through this voice menu, enter the tag you want to use in the Tag this call field. 8) If you wish to adjust the input options on your menu, use the settings in the Input Handling section. Speech Recognition enables callers to speak in order to select a menu option rather than making a keypress. Stop playing message on user input allows callers to skip past your recorded message if they already know the keypress for the option they want. The message will stop playing and the caller will be routed according to the option selected. 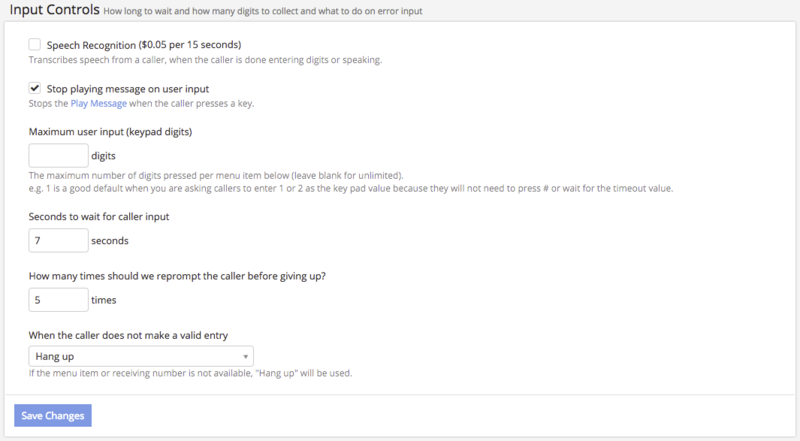 Maximum User Input is where you will define how many digits the caller can input. Define how long the system should wait for the caller to press a number under Seconds to wait for caller input. Select How many times we should reprompt the caller before giving up. We will play the first voice prompt once, and then wait for the caller to press a button. If the caller does not press a button before the Seconds to wait for caller input you have defined, we will play the message again in case they need to hear the choices again. Use the drop-down menu to define what action to take When the caller does not make a valid entry, meaning the caller presses a number that’s not an option, or they do nothing. Hang Up will end the call. Route to Menu Item will select one of your keypress options for the caller. Selecting this option will open a new field to define Route to the menu item matching keypress. After you configure your menu items (below), you will choose one of those options here. Dial Number will send the call to a receiving number. Selecting this option will open a new field to Select a receiving number. Use the drop-down menu to choose which receiving number we should route the call to. 9) Click + Add Menu Item to open the settings panel for a menu option. 10) By default, the first menu item you create will be keypress 1. Use the field in the upper left of the menu item settings panel to adjust this as needed. If you are using speech recognition, you can enter the word you want to trigger this menu option here. Only one word is allowed for each menu option. 11) Use the drop-down menu to choose the action that will occur when this option is selected. ​Dial Number will route the call to a receiving number. Use Voice Menu will send the caller to another voice menu in your account. Send Text Message will send the caller a text message. Collect Input will prompt the caller to enter information that you can view in the Call Log, and can also send the data to a remote server. Fire Pixel will send an HTTP GET request to a server. Call Agent will route the call to an individual agent (a user in your account). Leave Message will allow the caller to leave a voicemail message. Conference Call will route the caller to a conference room. Call Queue will send the call to a queue of agents in your account. Geo Route Caller will send the call to a geo router, where they will then be routed based on their location. Smart Router will send the call to a smart router, where they will be routed based on the rules you have set up in that router. Add to Dialer will add this caller to an auto dialer. Do NOT Call will add this caller to your Do Not Call list. 12) Each option type has its own set of additional options that can be configured. Fill in any required fields, such as number to dial, server address, or call queue to route to. 13) If you have selected an option that will connect the caller to a receiving number or a call queue, a Call Recording drop-down will appear to allow you to control whether the call will be recorded past this point. Default will use the existing recording settings on the tracking number that was called. This is controlled on the call settings configuration for each number. ON will enable recording for the call after it routes to this option. OFF will turn recording off for the call after it routes to this option. The Call Recording option is useful if you have a menu option routing to your billing department, so that the caller’s credit card details are not recorded. Tag this Call will automatically add a tag to the call if the caller chooses this keypress. Assign agent to call will automatically assign an agent to the call. If you are using custom fields, Update custom field will automatically update a custom field in the call if the caller chooses this keypress. 15) Click +Add Menu Item to add more options as needed. 17) Click Edit Assigned Tracking Numbers to choose which tracking numbers you would like to route directly to this menu. In the pop-up that appears, select the numbers you want to route here so that they appear in the list on the right, then click save. 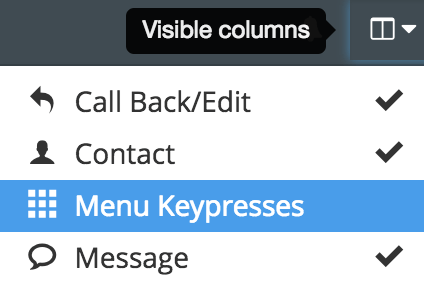 Once you start receiving calls, you can view the keypresses entered by each caller within the call log by customizing your columns displayed to show menu keypresses. Click the Visible Columns icon in the upper right area of the call log page and make sure the option for Menu Keypresses is checked. In addition, you can set up notifications to to go out via email or text each time a call comes in with a particular keypress. Notifications are created on the Notifications page within the Reporting menu. Learn more about creating automatic notifications here.